The guys over at networkmediatank's forums have been waiting anxiously for more details on the newest version of the PopcornHour and Sybas finally delivered the specs and a few pics (see below) to feed the frenzy. It's pretty big - much bigger than those older PopcornHour A110's. It looks like it will support standard DVD and Blu-Ray, but not HD-DVD - there's a removable drive tray that seems to support a hard drive, DVD drive or Blu-Ray Drive! Gigabyte Ethernet support finally. Too many media players don't yet support this. It comes with an RF remote control - something not all that common even these days. I'll be interested in seeing what that remote looks like. I would guess it will be something much less than a Harmony remote and closer in function/style to the Snapstream Firefly remotes. 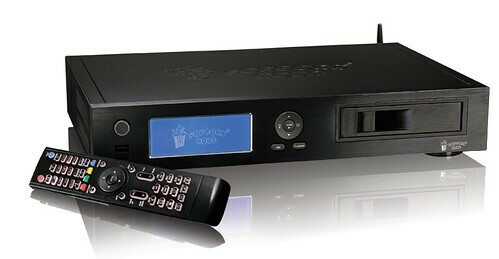 The C-200 will be running with the latest Sigma Chip SMP8643 vs. vs the Sigma Chip SMP8635 on the current A110. I didn't see anything showing price, but I'm betting it will start in the $300 price range at least. Those GB-PVR guys have to be excited about this media player as they can use this thing as a GB-PVR extender. The new PopcornHour will be called the C-200. LCD display for quickly searching, streaming and/or downloading content - useful for listening to music without the TV on!! !